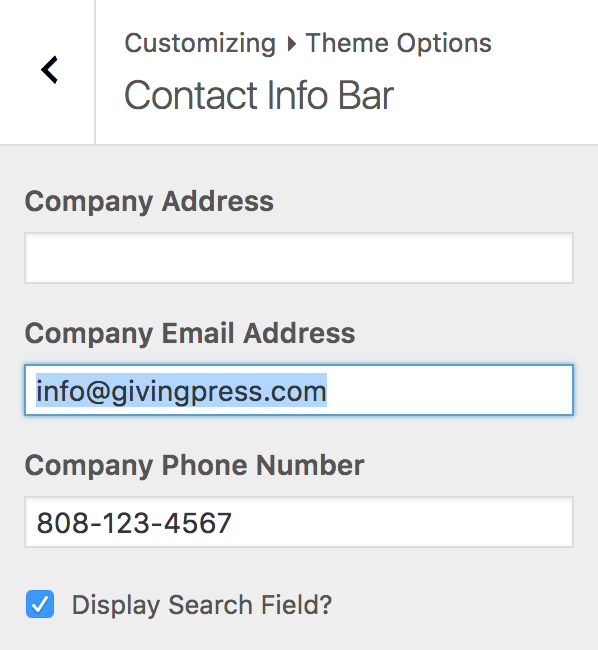 The contact info bar at the top of your GivingPress site is useful for giving your visitors a quick reference point for your contact details. But, in some cases, you may not want to include it. Contact Info bar, as featured on our demo site. 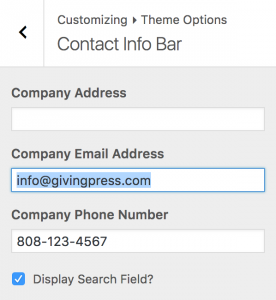 Login to the WordPress admin area of your GivingPress site. Navigate to Appearance → Customize within the left-hand menu to enter the Customizer. Within the Customizer navigate to Theme Options → Contact Info Bar. Remove the default placeholder content from each field. Upon removing the content, the contact information bar should no longer display on your site. Save your changes in the Customizer by clicking the blue Save & Publish button. When refreshing the website in your browser, the contact information bar should no longer appear at the top of the site.